Baklava, the flaky, phyllo-dough based pastry, has long ago stopped being a Middle Eastern regional specialty. In America, for example, it is now a staple of dessert menus at diners and falafel stands across the country. But these places miss the point: baklava is actually not a dessert, but rather an event in itself. Take a look how the item is treated in Turkey. A few years ago, during a visit to Gaziantep, a culinary Mecca in southeast Turkey famous for being home to the country’s best baklava, we watched with astonishment early one morning as people did the “wake and flake,” tucking into a plate of the sweet, multi-layered stuff for breakfast at one of the city’s numerous small baklava makers. In Istanbul, Karaköy Güllüoğlu is one of our favorite places for that kind of pure baklava experience. Located a stone’s throw from the Bosphorus, this baklava emporium has been catering to Istanbul sweet tooths since 1949. Done up in borderline tacky décor that looks like it is meant to evoke late Ottoman splendor, the place serves more than a dozen different kinds of phyllo-based sweets, none of them resembling the cardboard-like, past-its-prime version of baklava that is often dished out outside the Middle East. Along with its excellent classic baklava, made with either pistachios or walnuts, we are also fans of Güllüoğlu’s şöbiyet, a gooey, triangular-shaped phyllo pastry filled with pistachios and cream, and of a specialty called sutlu Nuriye, made of flaky layers of pastry drenched in a sweet, milky sauce. 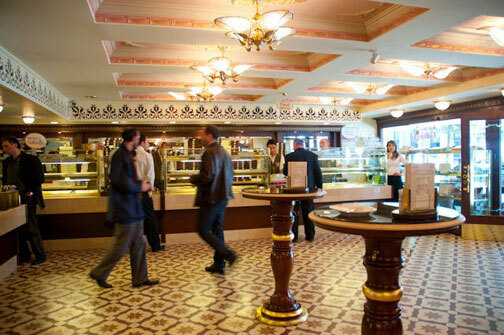 After you pick out what you want from the display cases holding large trays of baklava, you can either eat your sweets standing up at one of several high tables inside, surrounded by an unmistakably buttery aroma, or sit down at a table outside and catch the Bosphorus breeze. Like most baklava makers, Güllüoğlu’s founders hail from Gaziantep (there are actually dozens of families from there with the same name manufacturing baklava throughout Turkey, which can make things confusing). Although they have ramped up their production over the years, the place still seems to be sticking with tradition. On a flatscreen monitor inside, a promotional film shows grainy, black and white archival footage of a mustachioed Güllüoğlu employee briskly rolling out a paper thin, translucent sheet of phyllo dough. Cut to today, where – now in color – the film shows a mustachioed employee busy doing the exact same thing. Güllüoğlu has also stayed true to its Karaköy roots, still making its baklava in the neighborhood, at a facility just a few minutes walk away from its main store. You can sit down to eat baklava there too, gaining perhaps a few minutes of freshness over what’s found at the other location, although the atmosphere is decidedly less fancy. Of course, considering what they sell, both spots open bright and early at 7am – in time to catch the morning rush of baklava addicts. Can you mail me some of this please? I did not see anything on Kanaat Lokantası (on Üsküdar) and Ağa Lokantası (At Beyoğlu,on the little street next to the Aga Mosque and Yanyalı Lokantası on Kadıköy. There are so many baklava makers in Turkey, but I never tasted anything as good as what I ate at Imam Cagdas. It’s a wonderful experience. If you visit Gaziantep go to Imam Cagdas. You will not regret it !!! !